My favorite tool for creating shape is a familiar pair of scissors. 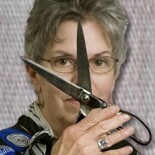 I would welcome a pair of scissors that could trim out clutter, tiresome relationships, and ill-conceived ventures. Maybe I need to do some shaking out first. I can let loose of useless perspectives and meaningless habits. I can be selective about companionship. Then I am going shopping for new scissors. This entry was posted in A Year of Listening, Uncategorized and tagged choice, Eleanor Roosevelt, evaluate, process, quotation, responsibility by norma17. Bookmark the permalink.